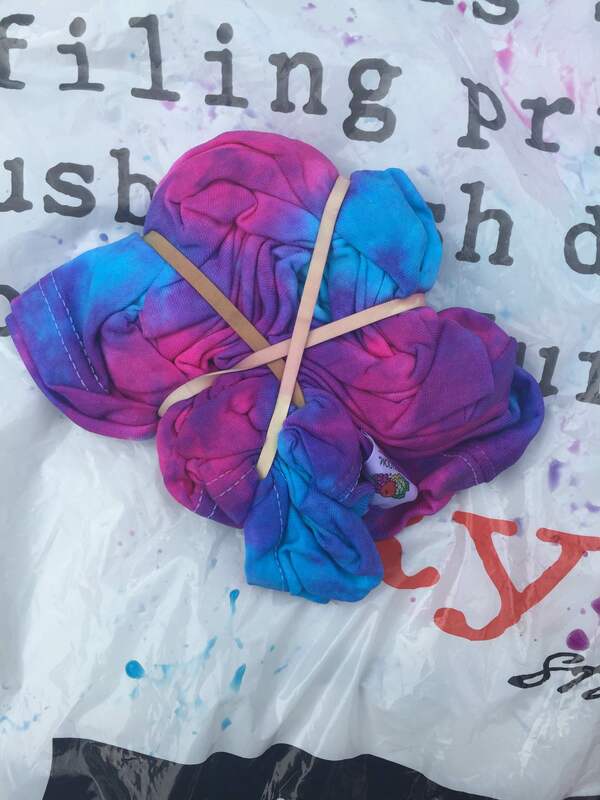 Tie Dying a T-Shirt for Summer! I am back with another post which is quite exciting! I love to make my own t-shirts by using transfer paper so I thought I would try tie dying a t-shirt as it was very popular last year. I bought all the equipment last year but didn’t get chance to do it so I thought I would do it yesterday. 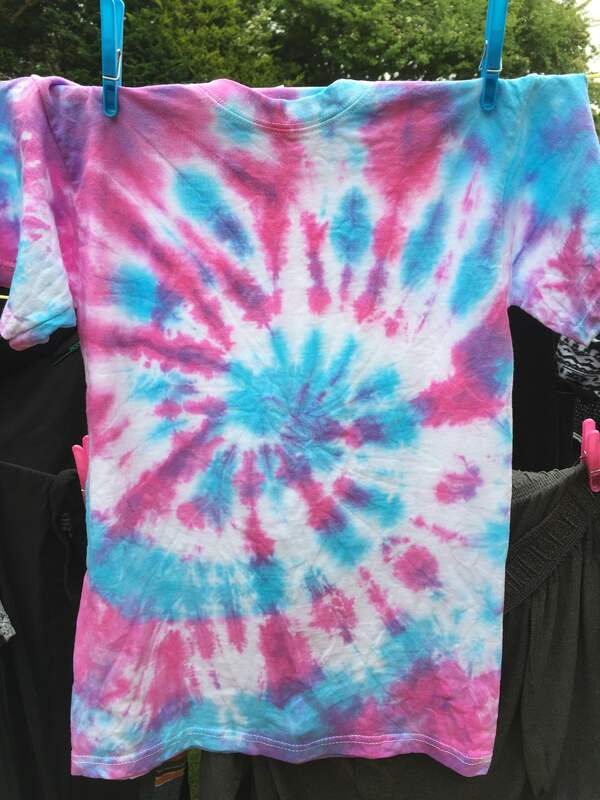 So here is how I tie dyed a t-shirt! Plain White T-Shirt – You can buy plain t-shirts from almost any fashion stores but I bought mine on eBay as it was cheaper. 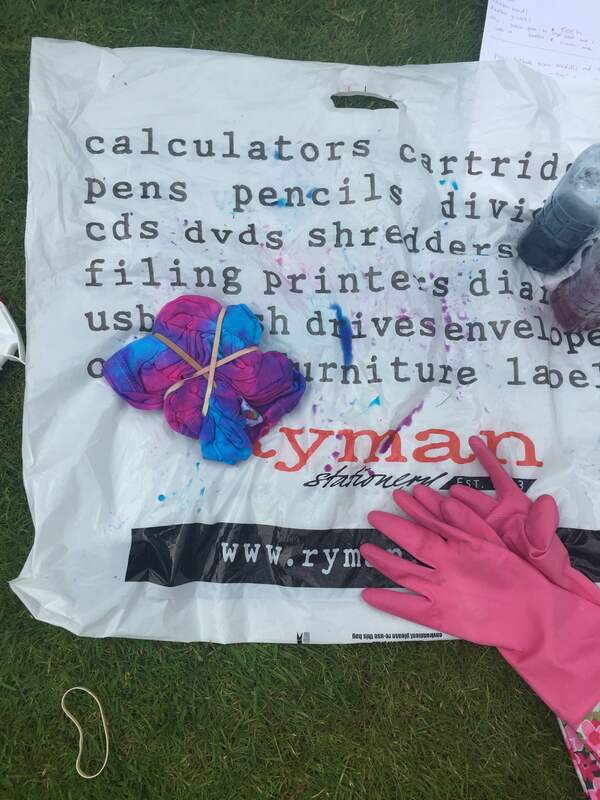 Dylon Fabric Dyes – I used Flamingo Pink and Bahama Blue but you can use any colours of your choice. Choose a minimum of two colours. Firstly, you need to either wash your t-shirt and leave damp or spray the dry t-shirt with water so it becomes damp. This ensures that the colour will absorb well. Next you want to lay your t-shirt out on a carrier bag and pinch the middle and swirl it to the right to make it look like a cinnamon bun, making sure all the layers are visible. Now you wan to put the elastic bands around the bun so they all cross in the centre. Now you need to prepare the dyes. Fill each 250ml bottles (I used old water bottles) with warm water and mix it up with 1 teaspoon of dye and 1 tablespoon of salt. Do this for both bottles. Put on the rubber gloves and squirt the dyes on alternate sections of the t-shirt cinnamon bun so its all colourful and then turn it over and repeat on the reverse side. Wrap the t-shirt in cling film and put in a plastic bag and leave overnight. The next day, undo the elastic bands and rinse under cold water until the water runs clear then throw it in the washing machine on its own. Ta Dah! Now you have a great tie dyed t-shirt! Please also note that they do fade. I love how my t-shirt came out! If you have any questions about this then feel free to leave comments down below. Also leave me suggestions of any other posts you would like to see! First of all, sorry I haven’t posted in a while I have been so busy/stressed! I am in the middle of my AS exams and GCSE’s have started so I thought I would write a post on how to deal with exams and keep calm! When revising, take short breaks as your brain cannot concentrate for a long amount of time with no breaks. After one hour go outside and take the dog for a ten minute walk! Stick revision notes around the house! This will help you remember them as you will see them regularly. Hopefully your parents won’t get too annoyed! Get a good nights sleep otherwise you may feel too tired to revise and no information will stick in your brain. When you are about to start the exam, breathe slowly to avoid getting anxious. And last of all, be prepared. There is no use revising everything the night before! I hope these tips have helped you and GOOD LUCK!